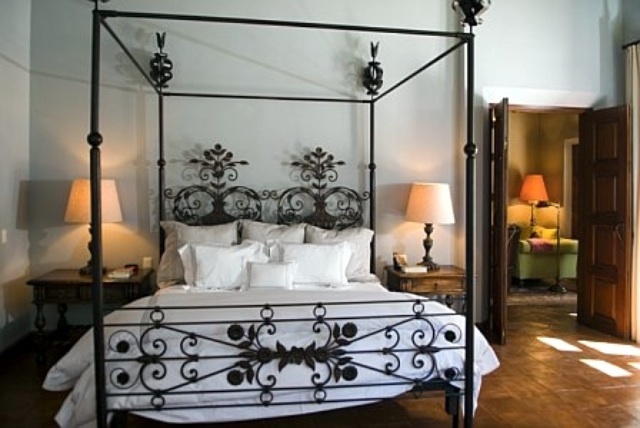 For the quintessential San Miguel experience, come stay at the elegant and spacious Casa Colibri, a 10,000-square-foot, newly constructed masterpiece set in tropically landscaped gardens. 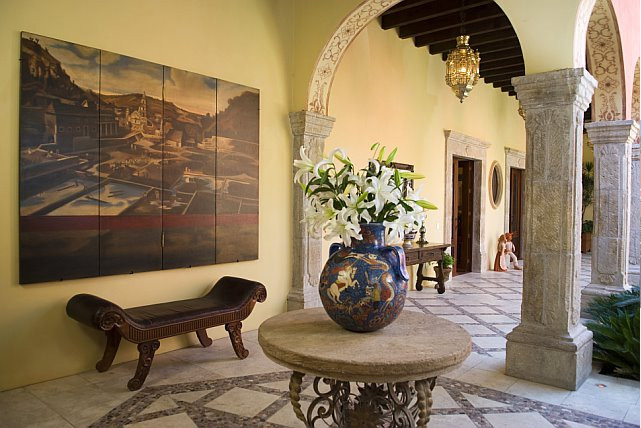 For the quintessential San Miguel experience, come stay at the elegant and spacious Casa Colibri, a 10,000-square-foot, newly constructed masterpiece set in tropically landscaped gardens. A lush oasis just 10 minutes by foot from the Jardin and close to Parque Juarez, this very special four-bedroom home was designed and built by Alan Wilkerson, one of the town’s foremost architects, who utilized the best of local artisans and craftsmanship to create a truly spectacular colonial environment, which also features all of the modern amenities. 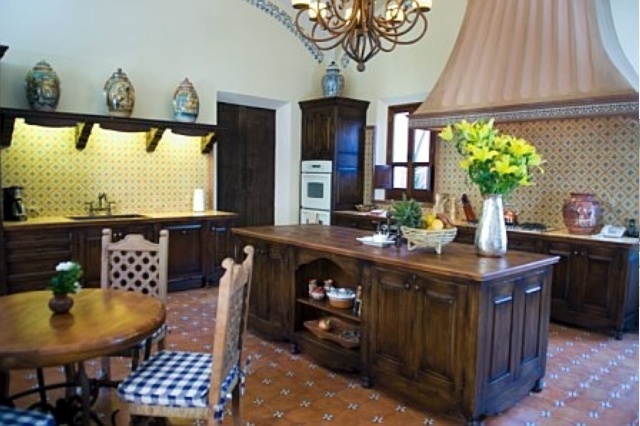 Casa Colibri is a perfect rental selection for three couples traveling together, as the bedrooms in the main house are of equivalent quality and size. 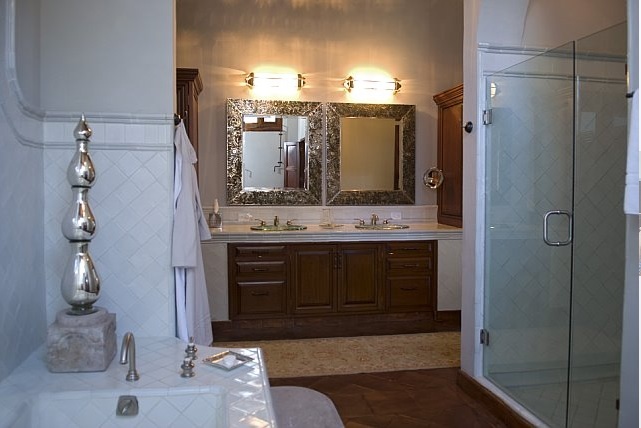 Three master suites – complete with king beds, fine linens, stone-carved fireplaces, en-suite bathrooms with both tub and shower and large dressing rooms – are found in the main house, with one bedroom on the ground level. Two of these gracious bedrooms have separate sitting rooms/studios with large-screen TVs, DVD players, custom bookshelves and additional fireplaces. It is also possible to rent the attached casita with its separate living area complete with comfortable seating, fireplace and desk, as well as a dining area and kitchenette with refrigerator, sink and cooktop. 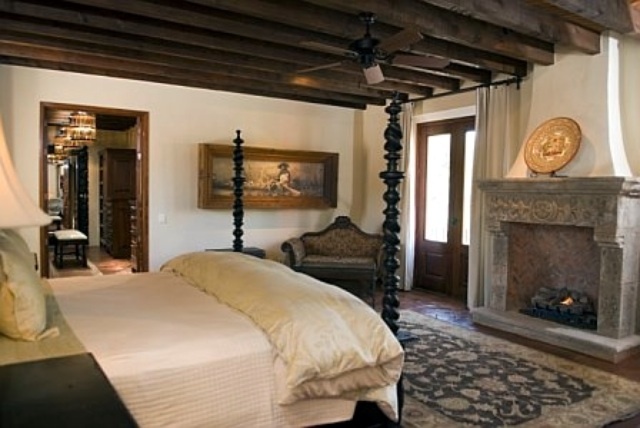 The bed in the casita can be made up as a king bed or as two twins. 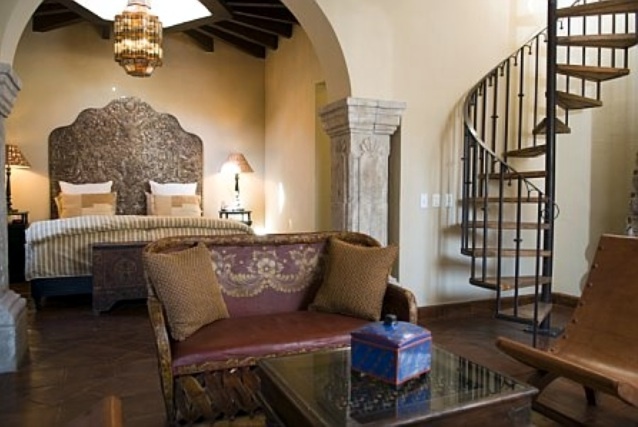 The casita also has a private roof terrace accessed by a spiral staircase. A cable TV is in the casita. A special rate is offered if just the three main bedrooms are used for a maximum occupancy of 6 people. 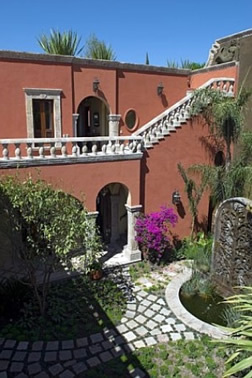 However, if renters wish to add the casita as a fourth master suite, or for older children, the house may be rented as a grand four-bedroom property with a maximum occupancy of 8 people for the rate of $4000 USD/week or $14,500 USD/month. All bedrooms and the sitting room/studios have Internet access via Ethernet cable that can hook into your own laptop. The bedding and towels are luxurious, all brought from Bloomingdale’s in New York. 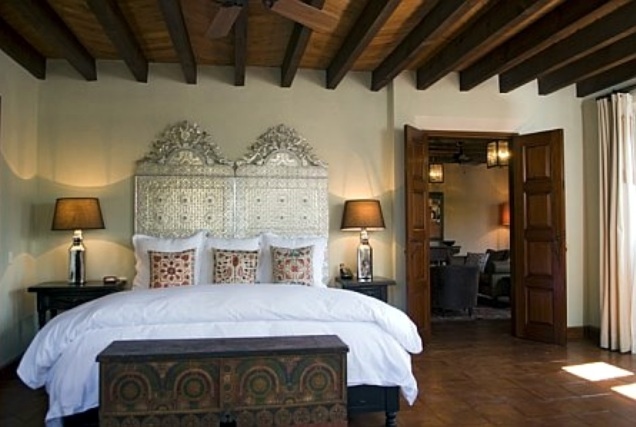 There is wi-fi Internet access in the casita bedroom and in the kitchen as well. The whole house is wired with a PBX phone system, including a free Vonage line for calls back to theU.S. and an intercom system. 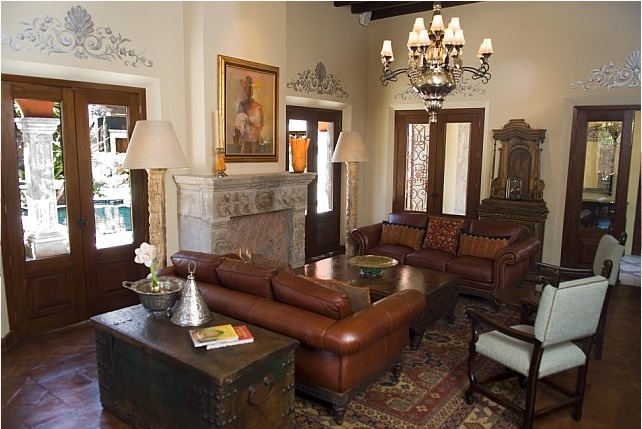 The common areas of the house are large and beautifully appointed with custom-made furniture, fine artwork and Mexican folkart. The atmosphere is elegant but warm, comfortable and inviting, made all the more so by the well-trained maid and cook who cater to your every need. 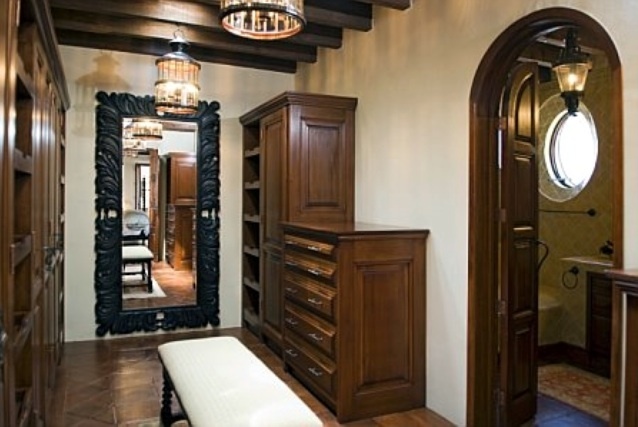 One enters the home into a dramatic open-air foyer with cupola ceiling. Columned open-air galleries circle the house, which open into the kitchen and the great room that houses both the formal living room and the dining room in one grand space. 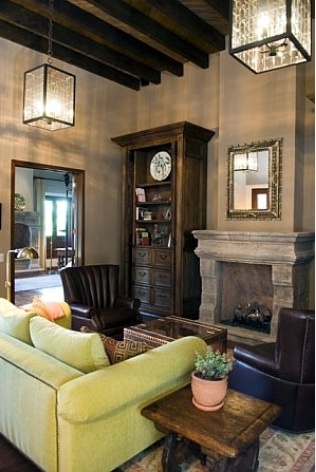 The living room has a large cantera stone fireplace and comfortable leather sofas. The adjoining dining room seats 8 people at a round table with vistas through a talled arched window into a side garden with a dramatic stone sculpture and water feature. 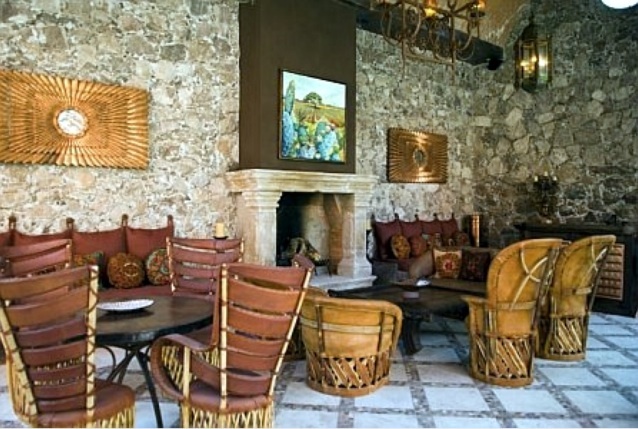 The dining room also opens onto the garden terrace where you can dine al fresco at a stone table. The fully equipped kitchen has a dishwasher, double electric oven, full refrigerator, separate freezer with icemaker (using water from the whole-house purification system), gas five-burner cooktop, microwave, butler’s pantry with wet bar and an in-kitchen dining area in front of the fireplace. A top-quality BBQ with infrared heating is in a side area off the kitchen. 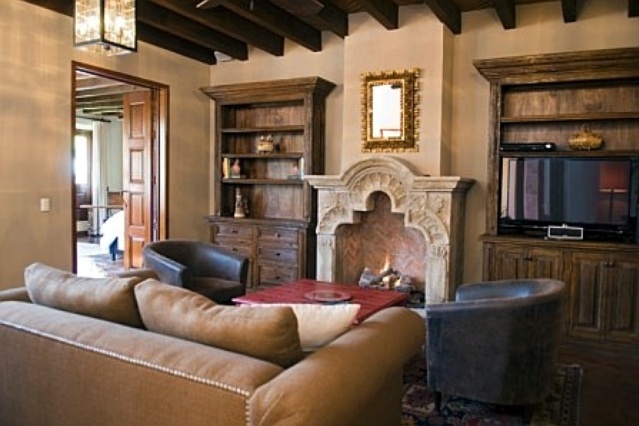 Overall, the house has nine fireplaces (eight gas and one wood-burning in the outdoor sala/living room). The outdoor sala has a table that seats four and other seating for lounging, plus another wet bar and refrigerator with icemaker and lots of storage for your beverages – a perfect spot to mix up your afternoon cocktails. A grand fireplace here makes it cozy in the evening, but you might also want to adjourn to the rear pergola with firepit and built-in seating. 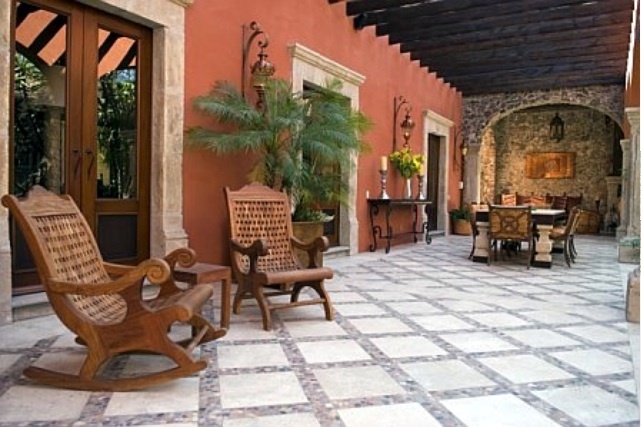 Casa Colibri is set admist green gardens and patio areas. The spacious front courtyard has a 12-foot “tree of life” sculpture and fountain. 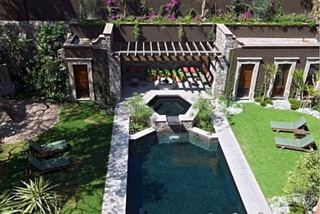 The highlight of the rear garden is a large (16’ x 28’ foot) pool, topped by an 8-foot-diameter Jacuzzi. Across the lawns is a special pool bathroom with sink and shower. Lounge chairs and a glass table and chairs complement the pool area. Above it all is an immense, second-floor roof garden with a lovely fountain, ample seating and beautiful plantings. There is is also a third rooftop level with comfortable seating, lush landscaping and a small fountain. 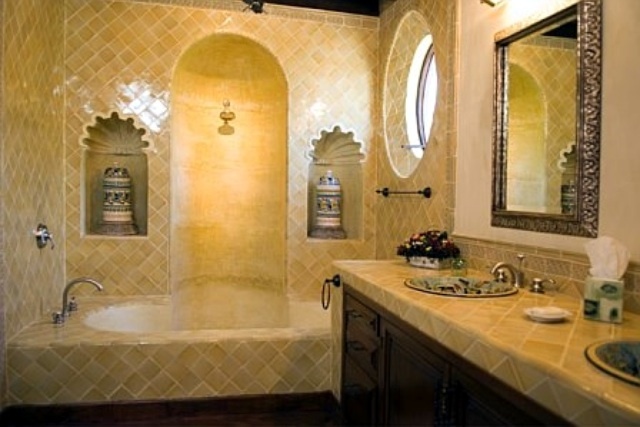 From this third level, you have the views of the Parroquia and the historic area. 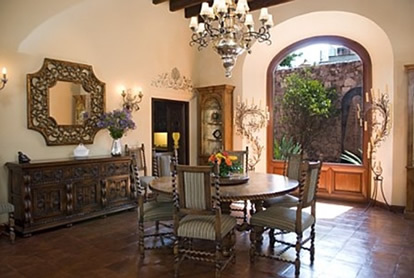 A 6% line item for Mexican taxes and administrative fees will be added to all rental rates. Please note that a 20% holiday surcharge is added to all rental rates during Christmas, New Year's and Semana Santa (week before Easter).